As I said last time,since there are only few weeks left before the buy-one-take-one offer expires, we will only eat at restaurants that accept The Entertainer vouchers . 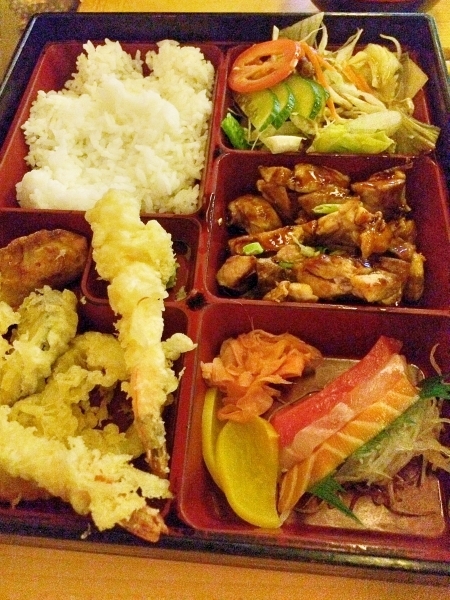 I just recently discovered Miyabi Sushi & Bento and I thought it’s one of the good Japanese restaurants in town. I was with Gibson and Biel the first time we tried the place and we were able to use two of our Entertainer vouchers. After only two days, we were craving again for some Japanese fix and we immediately thought of how good our earlier Miyabi experience so why not visit it again. Since we only have 1 voucher left, I called Jholen and asked if she wants to have lunch with us. I asked her not because she has unused Miyabi Entertainer vouchers, but because I just really want to be with her, true! Promise! 😇 I’m very glad she and Joseph said yes. Then, just when we were walking towards the restaurant, I realized that it’s a UAE public holiday and I won’t be able to use the Entertainer vouchers as per the condition. Pffftt! 😕 But since we’re already there, fine! It shouldn’t be that expensive anyways. 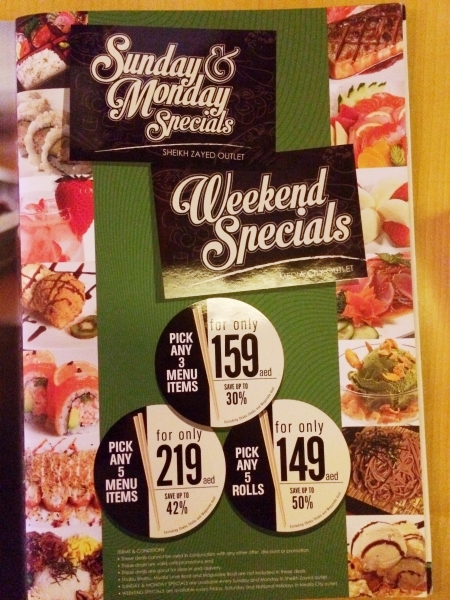 Surprisingly and good thing that Miyabi has a weekend offer which is valid during public holidays as well. Perfect! Their branch in Business Central Towers in Dubai Media City is buzzing with workforce crowd during weekdays and less crowded on weekends. We scanned the menu (see here) and decided we will have the 219 dhs for 5 menu items and was contemplating if our tummy can take the additional 5 extra rolls. We will be ordering at least 2 rolls for sure that costs around 100 dhs already and although I’m not a mathematician, paying an additional 49 dhs for 3 more rolls is quite a deal. So 5 rolls it is. 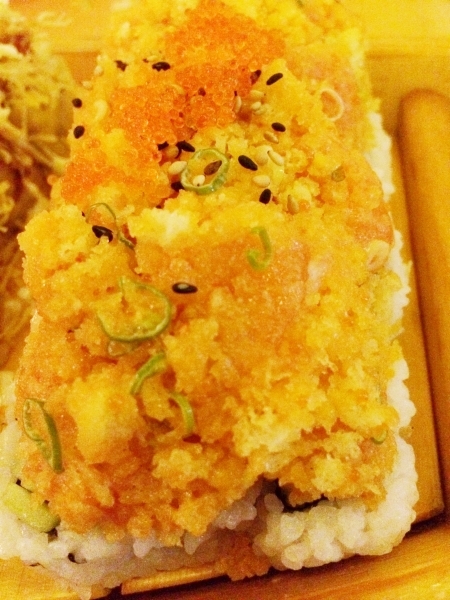 Crunch California Roll. 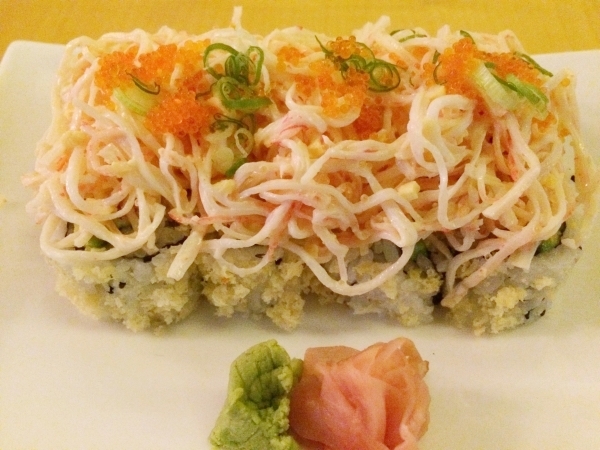 It’s the classic california roll but crunchy and topped with shredded crabsticks, fish roe and scallions. 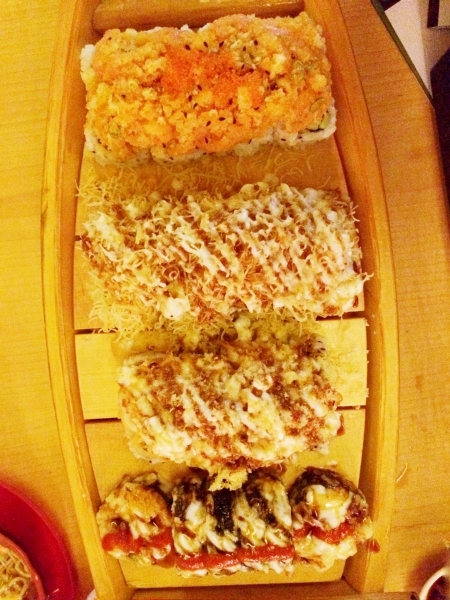 The other 4 rolls came in a boat and the servings were huge! I immediately knew that there’s no way that the four of us can finish it off. This beautiful mess is called Muni Roll. 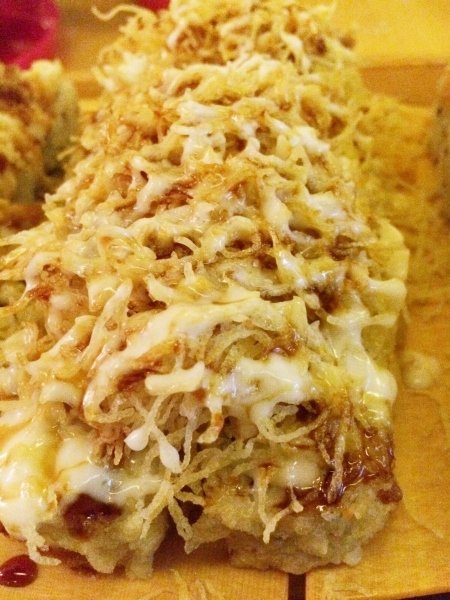 Again, it’s california roll topped with baked scallop and crab with sauce and cheese. 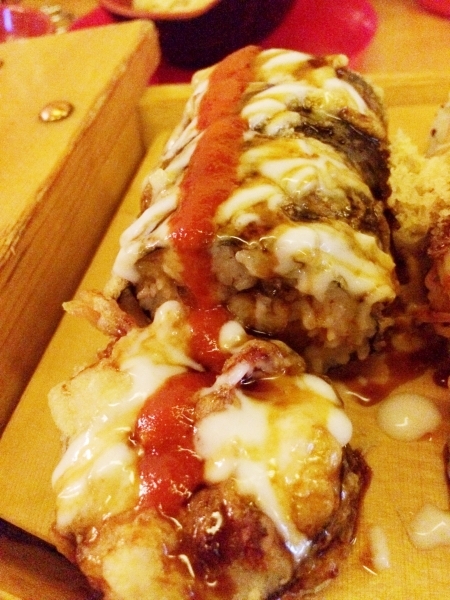 This is Godzilla roll and as the name implies, it’s really huge! 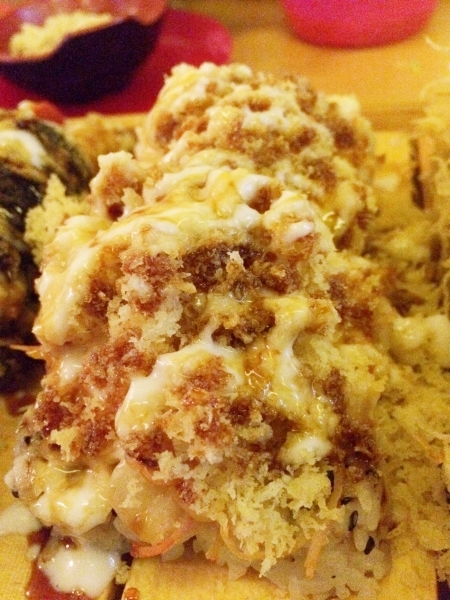 This is deep fried eel, spicy tuna and crab meat. Next is the Double Salmon roll which has spicy salmon and cucumber inside and topped with spicy salmon crunch, fish roe and scallions. The last one was a repeat order. We had the same roll last time Gibson and I dined here and want to have it again. It’s called Jumping Cali Roll. Deep fried crab meat and avocado. So, ok. That’s only our roll orders. How we were able to finish the mains can be considered a miracle. 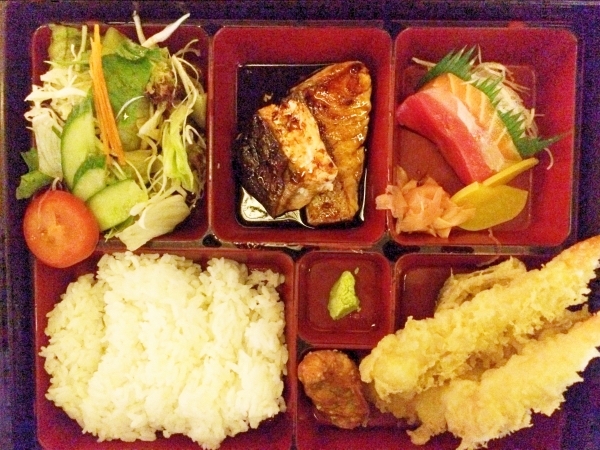 Jholen’s order: Shogun – sashimi, salmon teriyaki, mixed tempura and fried gyoza. Biel had the Seafood Ramen with soy sauce base soup. Ramen soup has a choice between miso or soy sauce base. I personally prefer the miso base but the one we ordered is “safer” with kids. I really don’t want to experiment and see if she would like the miso. Maybe when she’s bigger. Gibson ordered one of the more expensive dish on the menu. This is Una Don. 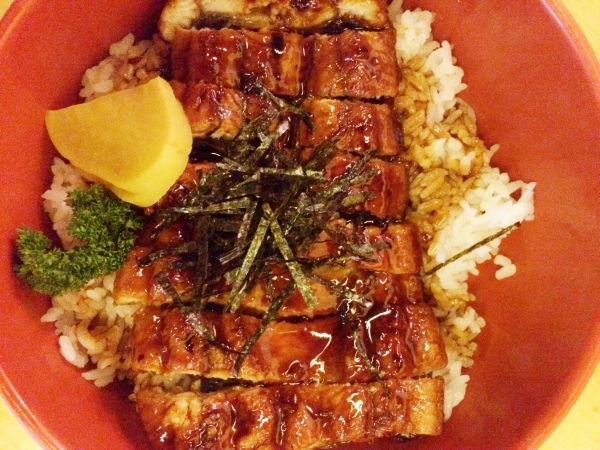 BBQ freshwater eel over sushi rice. The fish meat was very good. Although a little bit too sweet for my taste but when I partnered it with plain rice, perfection! And what did I order for myself? I actually had a taste of everyone’s food (actually, all of us shared each other’s order) and we enjoyed everything. We paid 377 dhs including a big bottle of water. I calculated how much was our order if we didn’t avail the weekend offer and the food we take (including water) would cost us 627 dhs. That’s 250 savings and almost 40% off! Not bad eh?! 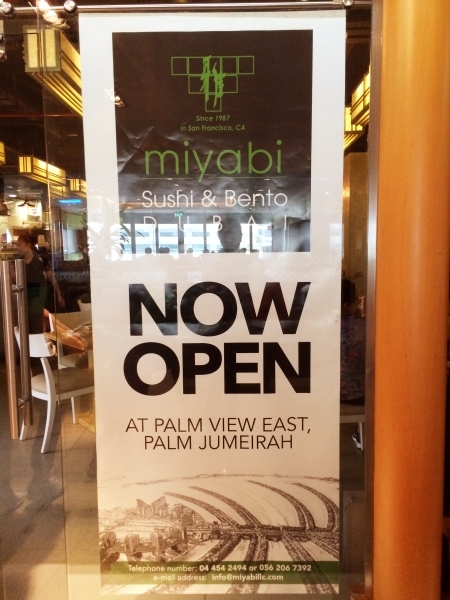 Miyabi Sushi & Bento has another outlet in DXB building in Sheikh Zayed Road, backside of UAE Exchange, next to Four Point by Sheraton. Their Palm Jumeirah branch is now open! Hubby’s order. 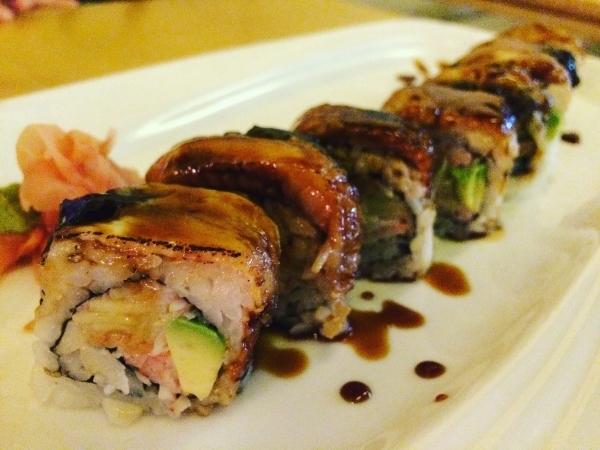 California roll inside with sliced eel outside drizzled with sweet sauce. I think it’s teriyaki sauce. Tastes good but I’m not very fond of sweet dishes. Although Gibson enjoyed it very much. This is called Tempura Udon. 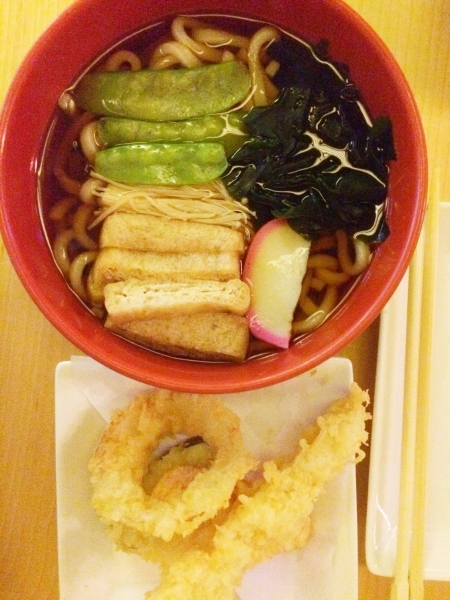 A simple noodle in broth with shrimp and vegetable tempura on the side. 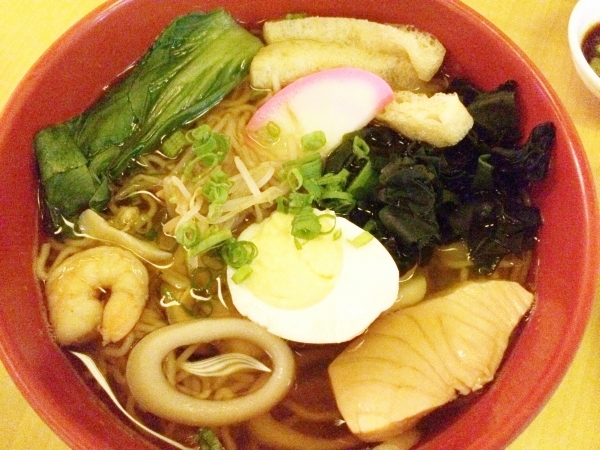 The ramen is perfect for Biel who’s sensitive to seafood and won’t eat meat. 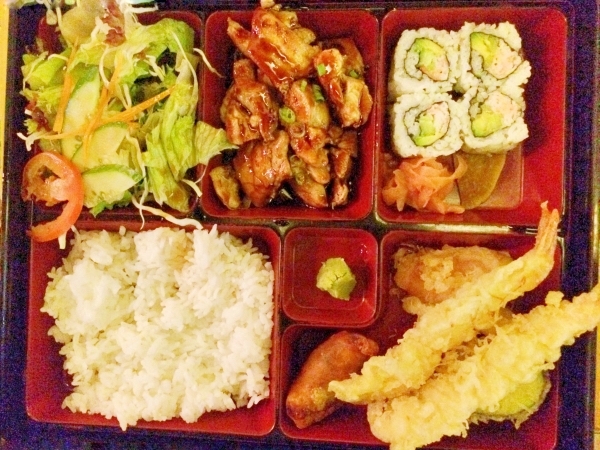 Miyabi also offers Korean dishes. 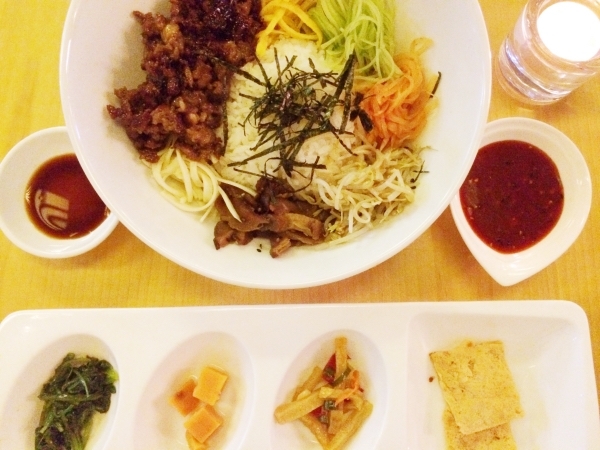 We tried their Bulgogi Bibimbap which is marinated Korean beef teriyaki with vegetables and rice. The fact that we dined in several ‘authentic’ Korean restaurants around town, I would say that this is a good attempt but better stick with the Japanese dishes.